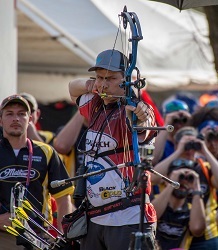 AMERICAN FORK, Utah - April 6, 2018 - Gold Tip Pro Staff Manager Tim Gillingham recently took home top honors in the second Archery Shooters Association Pro/Am of the year in Fort Benning, Georgia. Gillingham won the Known Pro division with a come-from-behind performance that relied on the extreme accuracy of his Triple X Pro shafts and Bee Stinger Premier Plus stabilizers. It was Gillingham’s second podium in as many tournaments after taking second place at the ASA’s opening 3-D tournament of the season in Foley, Alabama. ASA 3-D archery features competitive rounds shooting lifelike, three-dimensional animal targets made of foam. Amateur classes are decided by the final totals after 40 targets. Pro Classes shoot the same 40 targets. Then, the top five scores in each Pro class advance to a shootdown, where they shoot up to an additional six more targets with a more difficult 14-point ring added to enhance the risk and reward for extreme accuracy. With the win, Gillingham also extended his lead in the Shooter of the Year points race. He has a solid hold on the lead after a record-breaking 20-target score of 234 out of a possible 240 in the opening round of the Foley Pro/Am.